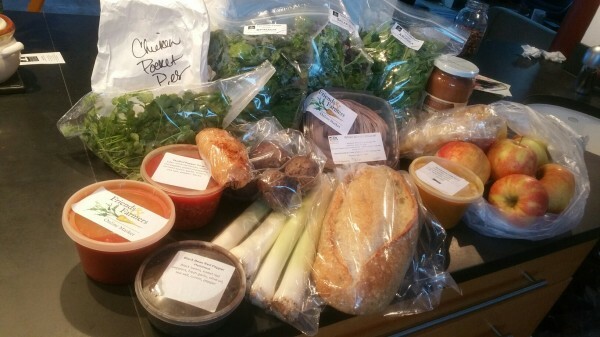 Since launching in November, the Online Market has contributed nearly $14,000 to the local food economy. The market averages 35-50 orders a week, and 250 people have registered as customers. Currently, the market partners with 13 vendors offering a diverse range of products, including vegetables, apples, meat, salmon, eggs, milk, cheese, bread, prepared foods, and hot sauces. The market recently added two new producers: Fasta & Ravioli Co. and Good Seed Baking Co., a dedicated gluten-free bakery in downtown State College. And Tait Farm Foods, which has been selling on the market since it launched, recently added its jams, shrubs, sauces, chutney, and vinaigrette. For a complete list of vendors, and to sign up as a customer, go here. Shopping is as easy as any online ordering. (To read about the experience of one member, go here). Once registered, you will receive product updates and reminders about ordering. Place your order between 6:00 p.m. Friday and noon Monday, then pick up Tuesday between 4:00 and 7:00 p.m. at Good Shepherd Catholic Church, 867 Grays Woods Boulevard, near Geisinger Gray’s Woods clinic, just a few minutes from Otto’s. Or, for customers in select zip codes, pay just $5 for home delivery. Stay tuned for some exciting Online Market developments, including a program for SNAP beneficiaries that will help them stretch their online market purchases.